The expansion of the airport began in 1982, after the necessary period of planning. The intention was not to build Europe's largest airport, but to build transit passengers favourite airport. A stay at the airport was supposed to be an integral part of the travel experience. Efficiency and precision were obvious demands, but focus was also on generating an oasis where international travellers could relax: beautiful architecture, Scandinavian design, and pleasant, light, and comfortable surroundings with plenty of shops, restaurants, and other facilities providing enjoyment and pleasure. The new cargo terminal was built in the eastern area of the airport. 28 August 1971 (1971-08-28): a Malév Ilyushin Il-18, HA-MOC crashed into the sea while executing an instrument approach. The main cause of the accident was microburst, a particularly dangerous and unpredictable meteorological phenomenon. 23 passengers and the crew of 9 died. 2 passengers survived. The captain of the plane was World War II flying ace of the Royal Hungarian Air Force, Dezs Szentgyörgyi. He was due to retire in less than 3 weeks. ^ "EKCH København/Kastrup" (PDF). AIP Denmark. Copenhagen: Trafikstyrelsen/Danish Transport Authority. 28 June 2012. part AD 2 EKCH. Archived from the original (PDF) on 16 June 2012. Retrieved 4 August 2012. 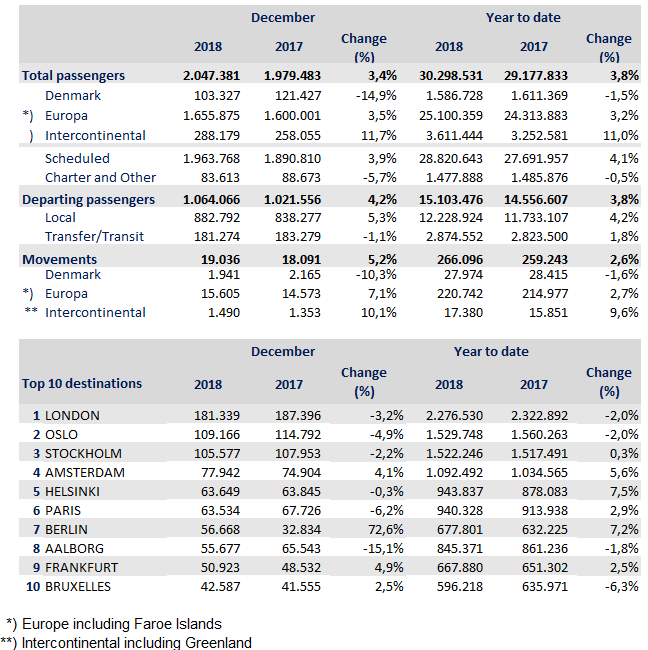 ^ 2018, UBM (UK) Ltd. "Croatia Airlines adds seasonal Split Copenhagen in S18". ^ 2018, UBM (UK) Ltd. "Iraqi Airways adds Basra Copenhagen service from mid-Dec 2017". ^ 2018, UBM (UK) Ltd. "Montenegro Airlines resumes Tivat Copenhagen in S18". ^ "Royal Jordanian resumes Amman Copenhagen route from June 2018". routesonline. Retrieved 8 January 2018. ^ Vueling Paris Copenhagen service changes in W17 Routesonline. 23 June 2017. This article based on this article: Copenhagen_Airport from the free encyclopedia Wikipedia and work with the GNU Free Documentation License. In Wikipedia is this list of the authors .